Not every home on the block has an ideal environment, with the promise of easy to create outdoor recreational and entertainment areas, a great lawn and pristine garden. Many times, it is necessary to undergo a certain amount of time and effort to ensure quality of life for your trees and garden. This will be necessary when you want to plant trees and build any type of construction. The most common type of landscaping issue is the grading of your Richmond yard. Ideally what grading means is to build a slope or a sloping area on your property. These slopes can provide proper drainage of water, can add beauty to your home and make it easier to take care of. Whatever you intend to build, plant or grow, grading is the most important thing to consider. The best time to undergo a Richmond grading project, is when you are doing construction on your home. It is a quite simple to ask for a few extra inches between the entry level and ground. These couple of inches will ensure easier development of a grade away from the house to improve the look of your environment and obtain a clean, dry basement that will not flood. 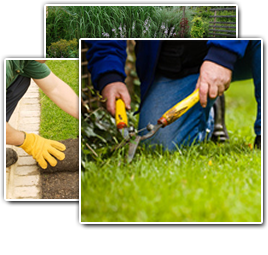 The first step in lawn or garden construction is rough grading. The amount of grading will depend on the condition of your ground, the desirable ground level and attention that an extreme slope will require. It is very important to stick as close as possible to the natural slopes in grading, this will cut your expenses considerably. The first thing you will do in grading is strip and separate topsoil from the area the level is going to be changed. If the grading is for construction of a terrace, then saving the topsoil is important. If this is the case, spread the topsoil in areas that are thin or use it in a flower garden, you cam save a great deal of money. Once you have your topsoil stripped, the under soil can be graded to the contours you desire. This will allow sufficient room for adding the topsoil you already removed. For your lawn, a gently sloping area works best, most expert landscapers recommend a minimum of six inches in slope for every one hundred feet of land. The same measurements can be efficiently applied to a stone terrace as well, this will prevent the pooling of water during rainy weather. When you have a thick subsoil made of clay, it is important to the well being of your lawn, that a drainage system be installed. If the soil is sandy, it is still a good idea to use subsoil drainage, because it provides quick and even distribution of water to the lawn or garden area. The first problem with drainage is to find an area where you can send the flow. If you live on low ground, water will flow from higher areas and this run-off area is very important. On higher ground, an underground piping system leading away from the slope will be enough. If you are constructing your very own drain run-off, it is easier to do a dry well. This is nothing more than a simple pit, four to six feet in depth and diameter, and is filled with rock. The well should be marked after it is covered, so you can locate it when water starts to back up on the lawn. Draining the subsoil is best accomplished by using tile lines. Semi-circle lines are laid in the upper soil layer, about one to two feet deep. The lines are two to four feet apart and covered with a foot of cinder before the dirt is replaced. The most effective landscaping idea for grading for tile lines is three inches for every hundred feet in length. When you are doing backfilling, you need to be sure to place all the soil you removed back in its place. If there are any slight mounds left after this, they will disappear after the first winter. It can be very hard, even for a pro, to measure the grades by eye sight alone. It is even harder still for a novice. You need two sticks and twine, if you are going to grade to level. You pull the twine tightly between the two sticks embedded into the ground. Once the rough work of grading is over then you will need to level, you can use a long board as your straight edge against the ground to use for accuracy.